Arden Way continues to earn its AA Red Diamond status. You'll find it on Shipston Road just five-minutes walk from the Swan Theatre and all the shops and eateries of Stratford. 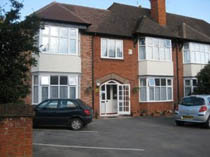 Arden Way is a family run bed and breakfast guest house offering a hearty welcome and is just five minutes walk from the theatres. It's cute, its tidy and high-standards are maintained throughout. There are six en-suite rooms on offer, each equipped with Freeview flat screen television, Tea/Coffee facilities and hairdryers. Although family prices are available, we would probably recommend it singles and couples who are looking for good value for money in a central part of town. There is a Private Ca Park and garden for relaxing in Summer. The guest house is conveniently located for touring the Cotswolds, trips to Warwick Castle and events at the NEC.